Social Impact Hackil (novembris 2017) pusis üks tubli tiim rahvaalgatuste parlamendis menetlemise vaate kallal. Ikka selle nimel, et oleks paremini aru saada, mis saab algatustest Riigikogu seinte vahel. Not many of us know that we can directly contribute to the Parliament’s work and make legislative initiatives in order to turn Estonia a BETTER PLACE for living. WHAT? 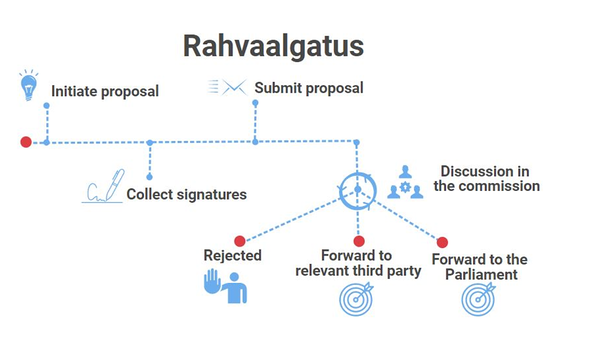 Platform rahvaalgatus.ee provides the opportunity to address the state collectively. HOW? If your proposal gets at least 1000 votes, the Parliament is obliged to discuss it. Since April 2016, 59 proposals have been initiated through this platform. 11 proposals have case-closed status. In our analysis we focused on these 11 cases. THE MAIN PROBLEM: People don’t actually know, what happens when their proposal has been sent to the Parliament for processing. SOLUTION: We are going to visualise the full life cycle of proposals to get insights! More light brought to the process helps to expand the reach of the proposal initiators. people’s awareness about certain important topics rises through the activity of media and interest groups.